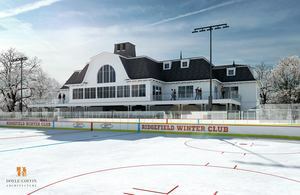 The Ridgefield Winter Club (RWC) today announced it has filed its formal application with the town’s Planning and Zoning Department to transform the old, deteriorating Pinchbeck Nursery into a strong family-focused winter destination that will bring community-wide benefits to Ridgefield. The RWC’s website and Facebook page host up-to-date plans and information that outline the vision for the Club and the benefits this project will bring to Ridgefield. The RWC will create a premier facility with an outdoor ice rink for families to gather socially and build community and camaraderie through a range of interactive indoor and outdoor activities. Indoor entertainment offerings will include four bowling lanes, a golf simulation room, a tabletop game room, homework rooms, casual dining with a bar, locker rooms, along with other amenities. Outdoor activity will focus on providing skating lessons, social family skates, and intra-RWC events, including hockey, figure skating, broomball, and curling to its members. The RWC’s ice rink and Clubhouse will operate seasonally from November through March, and the entire RWC will be closed during summer months. From April-May and September-October, the ice rink will be closed, and the Clubhouse will operate on a reduced schedule. On weekdays, from November through March, the ice rink will open for skating at 7 a.m., and hockey at 8 a.m., and all recreational activities on the ice will end by 9:45 p.m., or earlier. The ice rink will open at 8 a.m. on weekends and all recreational activities on the ice will end by 9:45 p.m., or earlier. The Clubhouse will close by 11 p.m., or earlier. For more information, please visit www.ridgefieldwinterclub.com or facebook.com/supportRWC/.